When you lose your Bluetooth headset what is a boy to do? Improvise! 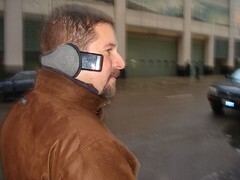 I don't need no stinkin' Bluetooth.....I'm just afraid of what's going to happen during the summer.....ear muffs won't be too warm will they? Such a clever young man!